By Peter Anderson 3 Comments - The content of this website often contains affiliate links and I may be compensated if you buy through those links (at no cost to you!). Learn more about how we make money. Last edited September 16, 2013 . When I was still a newer blogger way back in 2008, one of the first people I started talking to about the process of blogging was another blogger who was still new to the game as well, Jeff Rose. At the time my impression of Jeff was that he was an extremely hard worker, and that he was doing things the right way, by putting in hard work to create great content. I had a feeling that his site, and anything else he put his mind to, was going to be wildly successful, and do some pretty amazing things. I think I was right in my assessment, because Jeff has gone on to create one of the top personal finance blogs in the blogosphere, launch another great site about blogging with his talented wife Mandy, put out a weekly podcast as well as coming up with a ton of entertaining video content. He's constantly working on the next big thing. 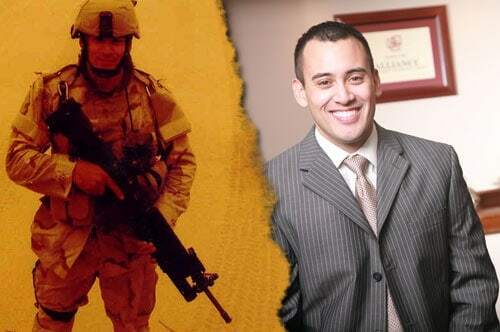 This week Jeff, who is a 9 year Army National Guard and Iraq war veteran and a Certified Financial Planner, just released his new book, Soldier of Finance: Take Charge of Your Money and Invest in Your Future. I know Jeff has been working hard on getting his book published for the past couple of years, and after having a chance to read an advance copy on my Kindle this week, it's definitely something a little bit different from your average financial planning book. The book takes the idea of our financial lives and compares it to being in battle. We have to have the discipline, planning and forethought to be able to be victorious in the battle on debt, and to plan our future financial goals. Jeff shares his own personal struggles with debt, and lays out a blueprint of how he turned things around. He shows how you can do the same. It's a great read, and I highly recommend picking up a copy at Amazon.com or Barnesand Noble.com. Jeff graciously agreed to do an interview this week to answer a few questions about his new book, his financial planning strategies and about his personal struggles with money. Without any further ado, let's jump right in (and don't forget to check out our book giveaway at the bottom!). 1. Jeff, first of all thank you for your service and congratulations on publishing your book. Having launched our blog at similar times and having talked with you over the years I know that you’ve had a book in the works for at least a few years now. What prompted you to finally write the book and make your dream a reality? I’m the type of person that when I get an idea I have to see it through. There are only a few times in my life where I finally just had to say no and scrap it. The book, however, wasn’t allowed to be one of those ideas that I could just scrap. I firmly believed that I had a powerful story to share and that many people could benefit from the material that’s in this book. That was the inspiration that wouldn’t allow my book idea to just disappear. 2. The title of your book is Soldier of Finance; can you tell me a bit about the idea behind the title and maybe a quick synopsis of what the book is about? The idea behind the title is combining both my military background, having served in the Army National Guard for 9 years including a 16 month tour to Iraq and my financial planning knowledge that I’ve gained in the 10 years I’ve been a financial advisor. To me a Soldier of Finance represents someone that wants a stronger relationship with their money and isn’t afraid to back down or give in if things get tough. The underlying message behind the book is even though you’ve made bad financial decisions in your life, you can still get your life on track if you really want to. 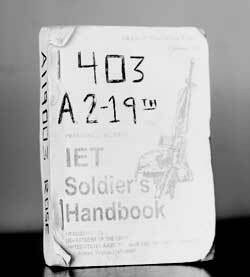 The book is modeled after the Soldier's Handbook that I was given in basic training. It gave us all the tools we needed to be a well-trained soldier. 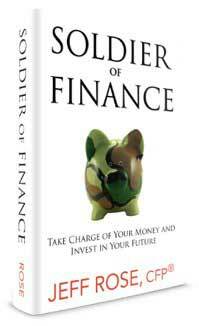 My goal with this book is for you to be a highly trained Soldier of Finance. 3. In the beginning of your book you talk about how being successful with your finances requires you to have traits similar to what a soldier is required to have. Traits like discipline, planning and forethought as well as commitment to achieving a goal. How does your book help people to start down that path to develop those qualities? I think the most important step before you do anything with your finances is understanding the “why” behind why you do what you do. For example, when I joined the military my “why” is because I needed my college tuition paid for; I needed greater discipline in my life because I was going nowhere and I needed extra money to live off of. The why behind, what’s the motivation of you getting out of debt. If you don’t understand any of those you’re bound to get nowhere really fast. 4. One concept you talk about in your book is the idea of having a battle buddy, an accountability partner in your finances. Can you expand on that concept for those of us who haven’t served in the military why having that partner for your finances is important? In basic training we are each assigned a battle buddy. This person was responsible in making sure that your gear was always squared away, that you were wearing the right uniform. This battle buddy was also responsible for knowing everything about you, where you were born, what your hobbies were, what your favorite foods were and what your family liked to do for fun. The key concept that the military was trying to instill in us was you have to have your soldier’s back no matter what and the only way to do so is to know how that person ticks. Your financial battle buddy is no different. For me my financial battle buddy has been my wife. She knows how I work. She knows my good qualities as well as my bad. If there is ever a time where I was going to buy something that I really couldn’t afford, she was always there to keep me in check. It may have caused a temporary rift between us at the time, but in the long run I see the importance of having her there to call me out. Battle buddies aren’t there to sugarcoat things; they’re there to tell you how it is, no matter what. 5. In your book you’re pretty open about how you’ve made your fair share of mistakes when it comes to money. Can you share what you think your biggest mistake with money has been? How have you learned from that mistake? I’ve made tons of mistakes when it comes to how I’ve managed my money but I have to think the biggest mistake was when I let my debt get out of control whenever I was in college. My father struggled with debt as long as I can remember and I started down that same path. I was racking up credit card debt and student loan debt when I didn’t need it because of the National Guard once again paid for most of my schooling. Even still, I found myself almost $30,000 of debt with literally nothing to show for it. When I finally realized how bad I had let the situation get (thanks again to my awesome battle buddy, my wife) I knew that I needed to buckle down and get my debt in check. 6. Why do you think so many people get into trouble with debt and have finances that are in disarray? What are the first steps you have people take once they’ve decided to make a change? I think the biggest issue that many people have is that they’re disconnected to what’s going on with their money. We become complacent. We have our bills set up on auto pay, we have our 401(k) automatically deducted out of our paycheck then go into some investment that we have no clue what it is. We’re just oblivious on what’s really going on with our money. I think the first step is working on getting a better relationship, getting more in tune to what’s going on with your money. Instead of having auto payments set up, especially if you’re struggling with debt, it might be better to set up where you mail in check so that way you know and can feel how much you’re actually paying for that car, cellphone bill, clothes, and dinner each month. 7. When setting up their financial battle plan what do you think people should include as components of that plan? Do you find that certain areas often end up being left out of the plan or certain areas stressed more than others? The first part of your plan is just having a good understanding of what’s going on with your credit. I talk a lot about this in the book but don’t want to make you think that you have to worry about your credit score every single day. While I think it is crucial for people to include that in their financial battle plan is because most people have no idea what’s going on with their credit. They don’t know what their credit score is, haven’t checked their credit report in who knows how long and at least getting familiar with what your credit history is might help you identify some areas that need some improvement. Once you get your credit in check it’s having a better understanding of what’s going on with your budget. Once again I personally hate budgeting but realize it’s super important if you have any hope of getting your finances in order. Online tools such as Mint.com or Personal Capital are perfect for getting a clear bird’s eye view of what’s going on with your money. After that when you start investing, I absolutely love the Roth IRA and typically will recommend that you start there because there’s a little bit more involved setting up a Roth IRA than the 401(k) through your job. The little extra work that it takes to set up a Roth IRA requires you to do a little bit more homework and become more accountable to what you’re putting your money into versus the cruise controlled 401(k). 8. Your book is now available in bookstores and online; can you tell us where people can get a copy of your book? If you happen to live close to a Barnes and Noble or Books-a-Million you can head over there to pick up a copy. If it’s more convenient, copies are also available at Amazon.com and BarnesandNoble.com. Thanks to Jeff for coming on the site today and sharing a bit about his book and about himself. To celebrate the launch of his book this week Jeff has agreed to give away a copy of the book to one of our readers here on Bible Money Matters. Entering to win will be simple. Just use the contest widget from Rafflecopter below, and get your various entries by following the directions. We'll announce a winner next Monday. Our newsletter winner is Barb J. Congrats! Not starting and keeping a savings account. Even still, I found myself almost $30,000 of debt with literally nothing to show for it. How did you get into that much debt?